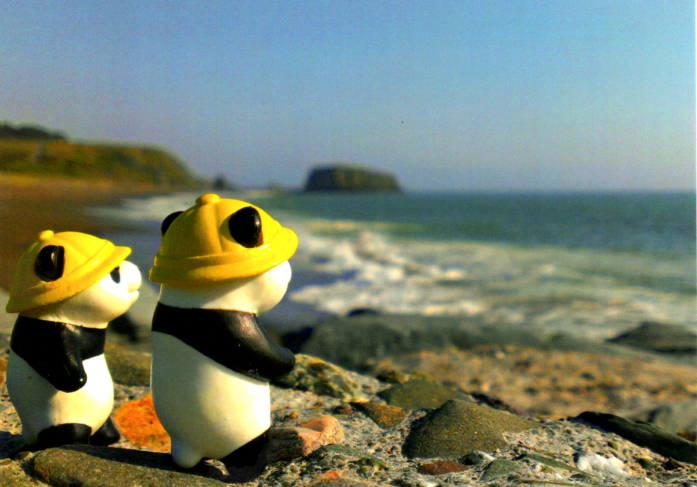 A new postcard in through Postcrossing! I love this! The artist is Сергей Белозёров, and more of his art can be seen at belozerov.livejournal.com. This one comes from Siberia, where the sender tells me that the first snow of the season has already happened, as of October 9! She also tells me I have an unusual hobby, which is sort of true, and that she likes my photos of marine animals. This is how she got on the topic of snowfall; her home in Siberia is very far from the sea. Two more in through Postcrossing! The card on the left comes from Shanghai, China. Before I saw the sender’s Postcrossing profile, I’d thought it was from Tibet, due to the photo & explanation. Interesting postcard: the image only takes up about half of the card’s front, leaving half again more space for writing than a traditional postcard. On the downside, I wouldn’t have minded a better look at Namso Lake! The sender of the card from Ukraine didn’t have the space advantage, but she overcame it by writing super-tiny, telling me lots of details about her favorite things! She gets an award for putting some effort into this thing we call snail mail. The card I sent to Rijen, Netherlands has reached its destination, after having traveled 5,499 miles in just 6 days. The big news is that 35 of my cards sent through Postcrossing have reached their destinations, and so now I have graduated from being allowed 8 cards out at a time, to the lofty number of 9 out at once! Half Moon Bay State Beach, California. 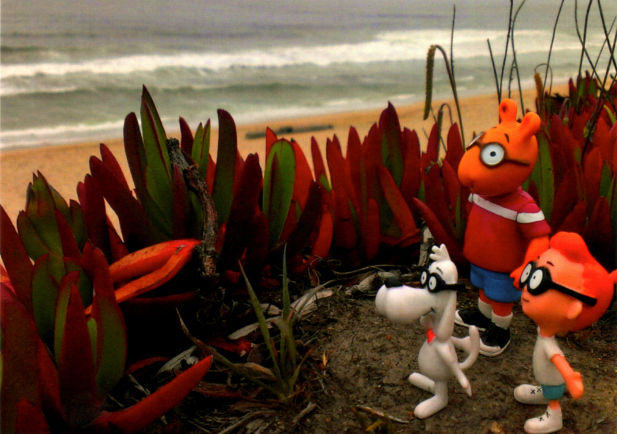 Seacliff State Beach, Aptos, California. Perhaps in this shot of mine you can make out a pier, and at the end of it, something resembling a ship. It is the S.S. Palo Alto, a concrete ship dating back to 1919. It was given a new life ten years later at Seacliff State Beach in Aptos, California, where it was turned into an entertainment destination–with a swimming pool, arcade, restaurant & dance hall. Its owners were hit by the Great Depression, though, & shut down the operation. Probably for the best, since it wasn’t much later that a storm came along & cracked the ship. These days, you can walk right up to the ship on the pier build for it–but you cannot pass the gate; the ship, as you see, is now for the birds. And just wait until you SMELL the thing! The card I sent to Chungnam, South Korea reached its destination after traveling 5,697 miles in 13 days. 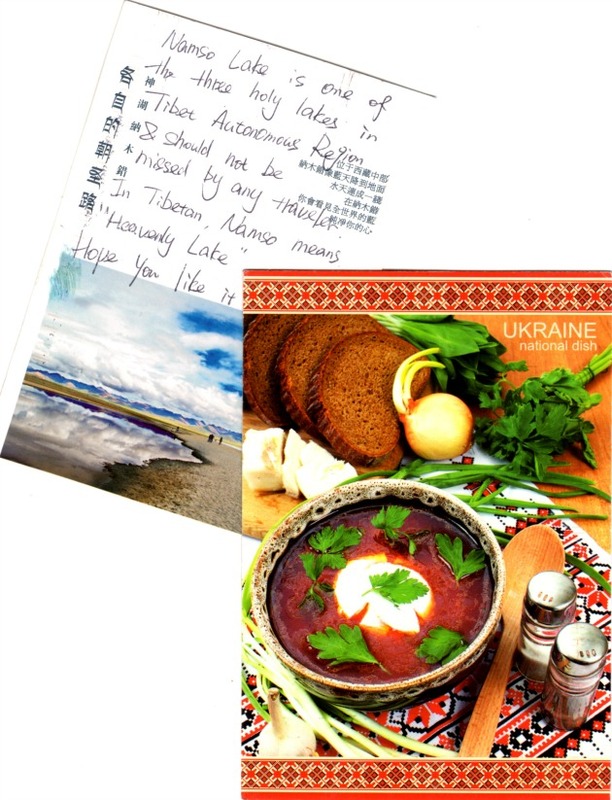 Now, I get to send out another card, and this one is heading for: Kiev, Ukraine. The recipient enjoys beautiful nature, including the sea–just like me–and so I sent her the first from my brand-new batch of postcards made from my photos! “Cheers” by Alexander Wolf; “Rhumba Band II” by Lill Tschudi. 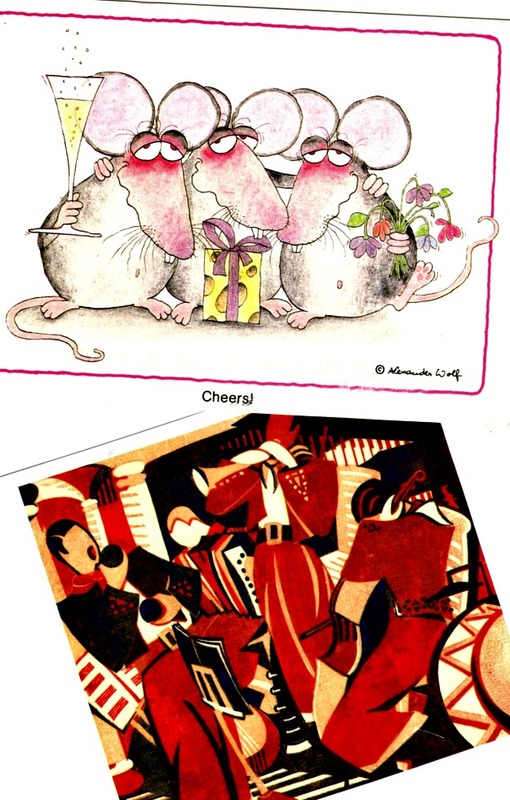 The card at top comes from Canada, and the sender jokes that the mice are some fairy tale side show characters, most frequently appearing in pub scenes. Well, that was definitely less fun than a barrel of monkeys. I am, as I’ve said, not into this to collect postcards or stamps, but to experience the joy of snail mail, which I thought might include brief peeks into other lives, places, and cultures. And so it does, so I will shut up–for now. 2 in through swap-bot, both from Netherlands! 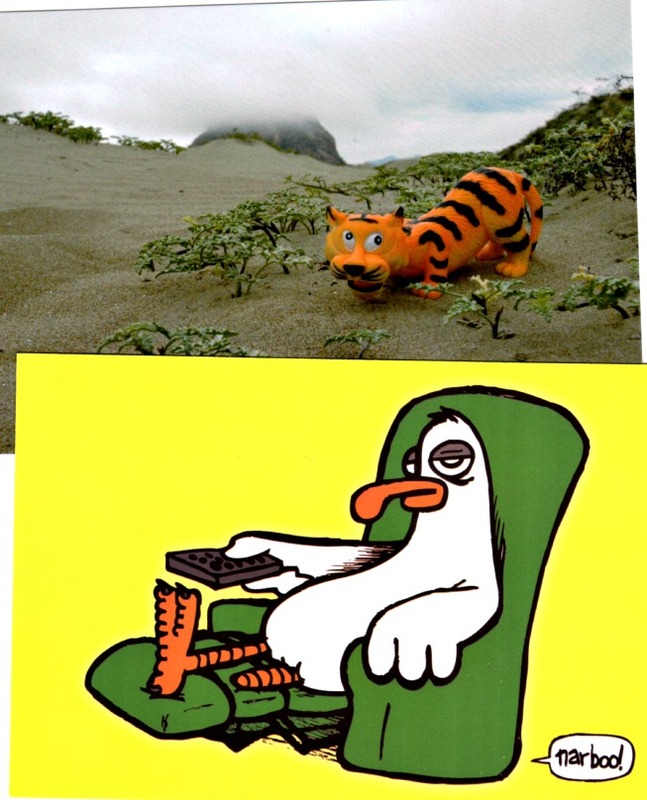 The Garfield card is for a “Postcards Through the Alphabet: G” trade, in which “G” would seem to stand for, “GEE, that cat seems to be missing a vital body part!” The sender says I have an interesting hobby, telling me she really likes my pictures. The card with the Frog Prince (by the artist Ernst Kahl is part of an illustrated postcard swap, and comes from a Hollander who tells me she loves crafts, snail mail, photography, her two bunnies, books, and TV series! Oh, and music–especially on vinyl. It’s nice to get a card from someone who has so much to say. I especially love those birds. I think I’ve seen cousins of these two running around at the Monterey Bay Aquarium! From someplace in or near Minneapolis, Minnesota, comes the space shuttle card. It is part of a “if money weren’t a problem” fill-in-the blank swap, and the sender writes that she would: 1) retire; and 2) do a zero-g plane ride more than once. Me, I’d certainly fly a lot, but it’s more about the destinations, so I’d probably want to keep my g’s about me. The card on the right comes to me from Galt, California, and is part of the illustrated postcard swap I entered recently. The sender mentions her love of Casper comics; this is based on my swap-bot profile, which includes a photo of some Spooky/Hot-Stuff comics covers (saying this is as spooky/creepy as I care for). BTW, I consider Wizard of Oz pretty spooky/creepy! 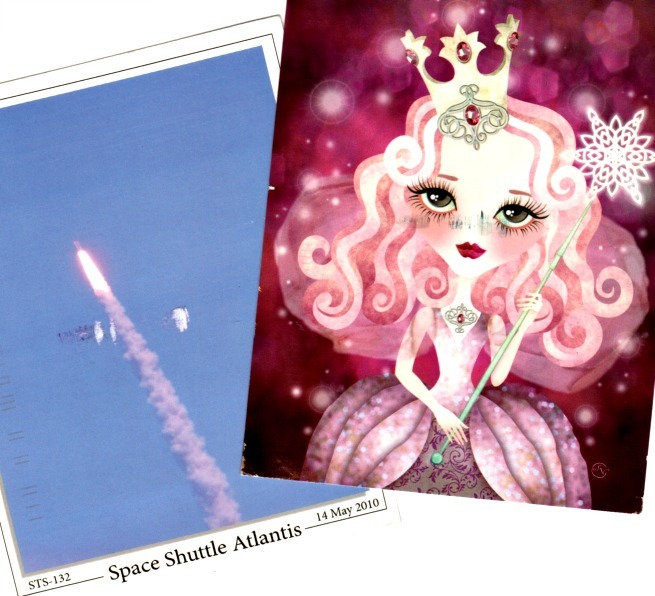 THREE of my Postcrossing cards have reached their destinations! The card I sent to Medicine Hat, Alberta, Canada found its destination after going 1,030 miles in 17 days. I have got to wonder if the recipient was on vacation when it arrived! That is the thing about the stats–we often don’t know quite why one card takes twice as long to travel 1/5th the distance of another. And finally, my postcard sent to Nagasaki, Japan found its way there after a trip of 10 days and 5,733 miles. Now I get to send out three more. Tiger card goes to Taipei, Taiwan. 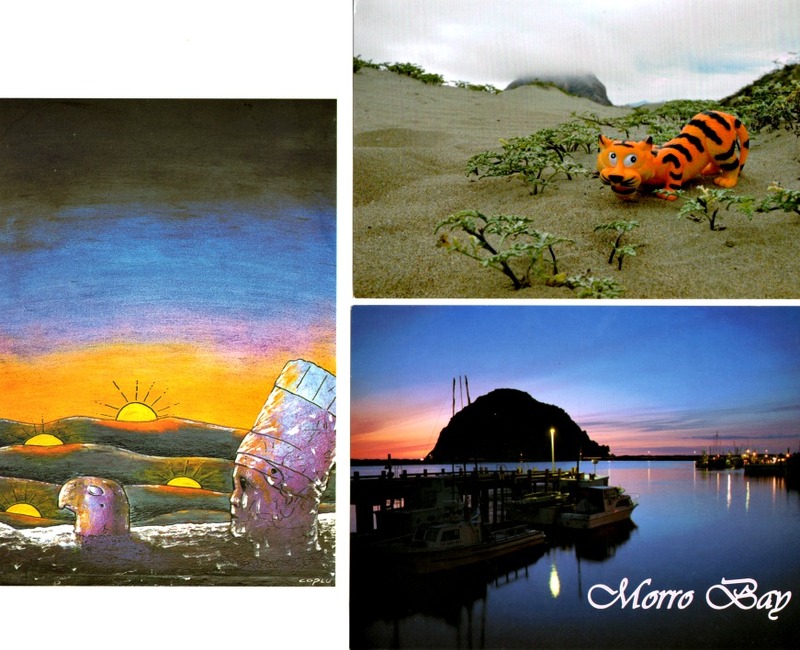 Morro Bay card is on its way to Dortmund, Germany. The card I sent to Elspeet, Netherlands has reached its destination, after a trip of 5,477 miles and 7 days. So now I get to send out 2 more cards via Postcrossing. Two unique pieces of art. The top card goes to Bang Bo, Thailand. It’s my first card to–or from–that country! I wish I could go along with it, and enjoy the scenery, the art, and not least of all, the food. 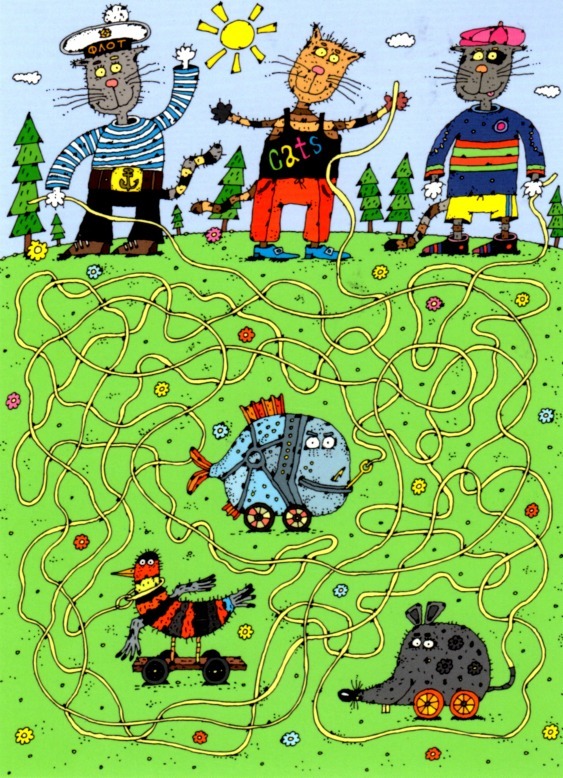 The bottom card, another by the artist Narboo (seen on this blog several times–though not nearly as many as that tiger), goes to Rijen, Netherlands. 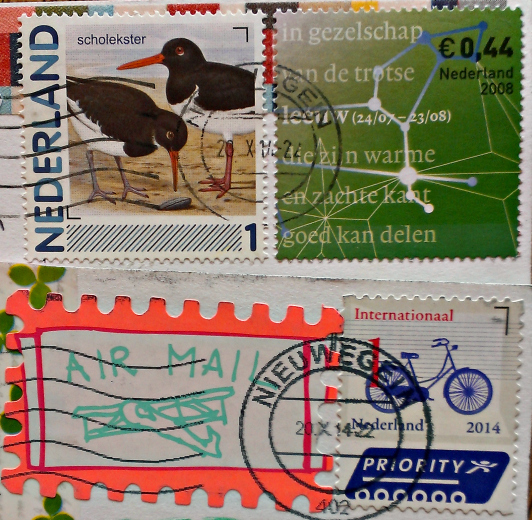 SO MANY Postcrossing users in the Netherlands! 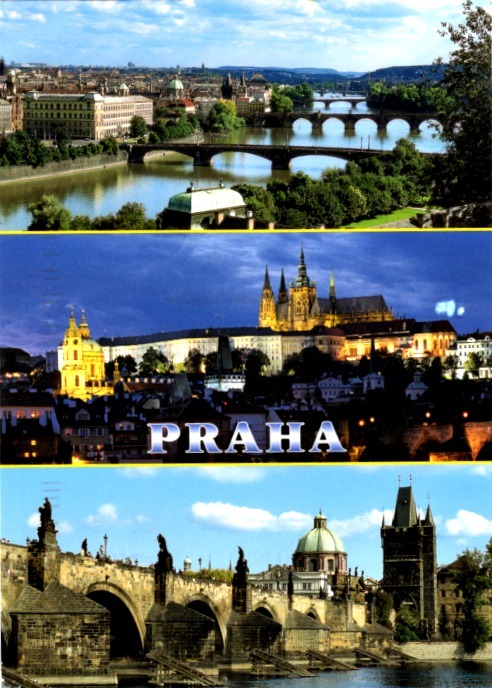 My list of traveling postcards nearly always includes Netherlands & Germany. I’d attribute it to a lack of familiarity with English (the official language of Postcrossing), though in actuality, it is clear this person has a firmer grasp on the language than, say, the average American Facebook poster. I think, in reality, it’s just that she is a newbie, having sent out only about 4 cards so far. It is to be hoped her “what do I write” skills get better; not everyone’s do, as I’ve learned in my experiences so far on swap-bot!